We at Cafe Troy are devoted to local freshness and quality ingredients. We search the area for the finest quality food the area has to offer. We gladly work with you to refine a dining experience that will be unique and unforgettable. Whether you are planning a exquisite cocktail reception or a formal dinner, we are here for you and will work with you to design an event that will suit your budget and taste. as we continues to strive to serve you the best the area has to offer. With your Classic Dinner Menu we include a Bar Service in the price. The Bar Service is open1/2 hour before the dinner and includes standard bar drinks, wine, and domestic beer and pops. During dinner the wine service includes one bottle of red wine and one bottle of white wine per table. For more details see the Polices and General Information sheet at the end of this document. For information on Vegetarian Menus and Children's Menu, see the Polices and General Information sheet at the end of this document. 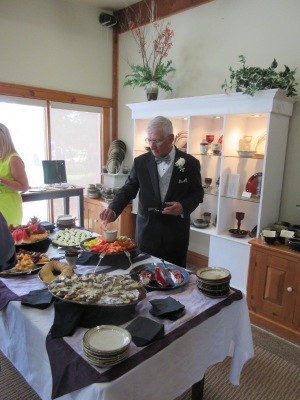 Hors d’oeuvres service may be added to the Classic Wedding Package for an additional price per person. Please consider the following selection with can be added to your event. Cheese Plater which includes an assortment of Canadian Cheeses and Crackers. If you wish other choices then our Chef would be most willing to accommodate you. Cafe Troy seats a maximum of 55 guests. To reserve Cafe Troy, a deposit of $500.00 is required. This deposit is non-refundable and must be submitted to guarantee the private use of the room. The deposit will be applied to the final invoice. 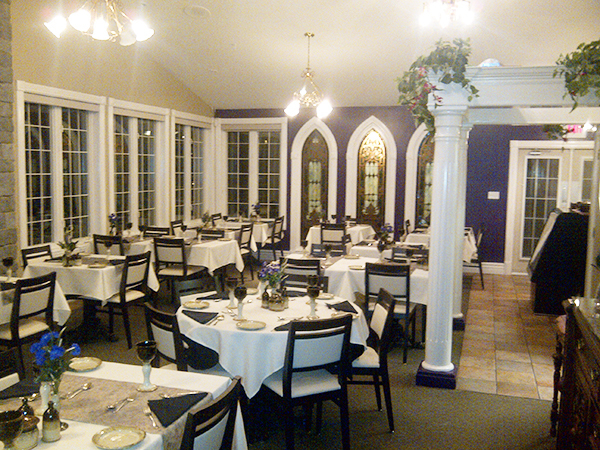 The rental fee for the dining room at Cafe Troy is $500.00 for Friday, Saturday or Sunday. Weekday rental is $300.00 This fee is subject to taxes and includes House linens, Cutlery, Glassware and Handmade Pottery for serving. The Cafe may be utilized from3:30 p.m. until midnight. I would like to sincerely thank you all again for all your efforts in making our wedding an absolutely wonderful day! Not only were you all so accommodating and kind, you went above and beyond! You all made everything from planning to hosting the day so easy that not once did I worry that our day would be less than perfect! From the moment I met each of you I knew our wedding was in good hands. Donn -- your home is absolutely breathtaking (and the envy of many of our guests!) and you were such a calming presence. Your kindness was noted by many and reflected in your hospitality. Also, your pottery is absolutely stunning! I cannot wait to return to add to my new Donn Zvet Pottery Collection! Carlos -- the food was amazing!! We had so many compliments from our families (some who are real "foodies" and some who are very fussy!) Everything came out hot, tasted so fresh and presented beautifully! Your passion is shown on every plate you serve. Thank you for all your hard work and preparation! Paul -- you were so refreshing to work with! Not only are you so kind and compassionate, but you have such an eye for detail. Although it may be a little surprising, but from years of working in service I am pretty particular about how dining areas are set up and hold a pretty high standard for service. Not only was the cafe absolutely beautiful -- you made everyone feel so welcome and cared for. We had many compliments on your service and friendly demeanour. Plus you rescued Quin's shirt from a gravy disaster seconds after it happened! I really cannot thank you all and your staff enough! Quin and I plan to celebrate our wedding day with you all for years to come! 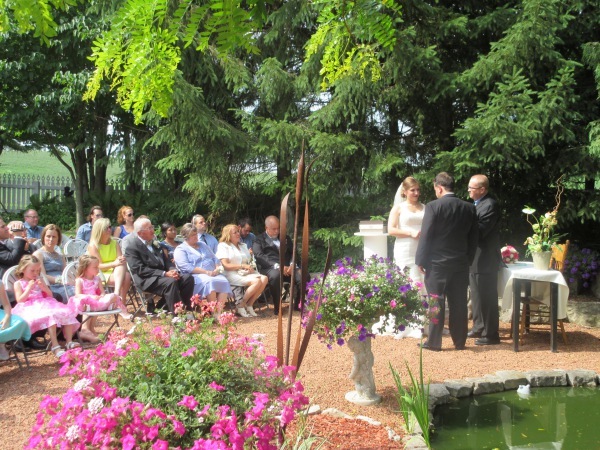 Confirmation fee: A confirmation fee of $1000.00 is required to secure the use of the facilities, and is refunded following the post-wedding inspection. Cancellation: The initial deposit of $1000.00 is non-refundable and non-transferable to another date unless otherwise agreed upon. 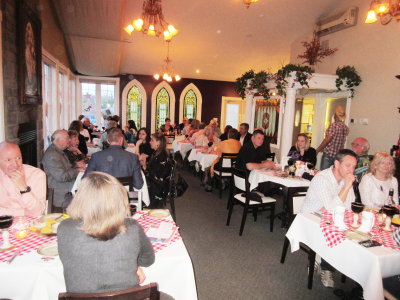 Room Rental: The rental fee for the dining room at Cafe Troy is $500.00 for Friday, Saturday or Sunday. Weekday rental is $300.00 This fee is subject to taxes and includes House linens, Cutlery, Glassware and Handmade Pottery for serving. This fee is for use of the Cafe for 7 hrs. If the wedding exceeds this time then there is an additional fee of $100.00 per hour. 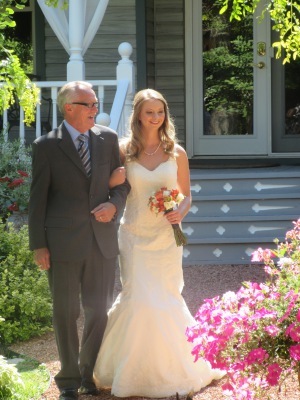 Wedding ceremonies can be held in our perennial gardens from May 1st to October 1st. A fee of $300.00 will apply. Chairs, podium and tents are not included. Payment Terms: The event must be paid for 7 business days prior to your event. Payment must be made by certified cheque, cash, bank draft or personal cheque. Personal cheques are subject to fees if the cheque is rejected. Number Confirmation: The guaranteed number of guest is required 7 business days prior to your event. The guaranteed number is not subject to reduction once it is submitted. All seating charts arrangements are to be confirmed 7 days prior to the event. Menu Selection: Final Menu selections beverage arrangements are to be made 14 days prior to your event. If you have guests that have special dietary requirements, these too must be submitted 14 days prior to the event. Taxes: The 13% HST applies to all food, beverages and labour, service charges and room rental/set up fees as is required by federal law. Service Charges: All food, beverages, service and rental fees are subject to 18% service charge on the total price. Health Regulations: Food and beverages are not to be brought onto the facility with the exception of the wedding cake which must be made by an established business that is municipally inspected and approved by Cafe Troy. No food made on the premise is allowed to be taken from the sight. This is Food Regulation requirements. Alcoholic Beverages: All Alcohol is to be provided by Cafe Troy. Alcoholic beverages not provided by the Cafe will be conficated and disposed of immediately as per the Liqour Licence act Act of Ontario. This includes all of the Cafe property, in and out. Host Bar: We are regulated by the Liqour Control Act of Ontario. Therefore a host bar does not mean unlimited or "all you can drink" bar service. All staff are Smart Serve Certified and reseve the right to halt service to any guest before the point of intoxication. 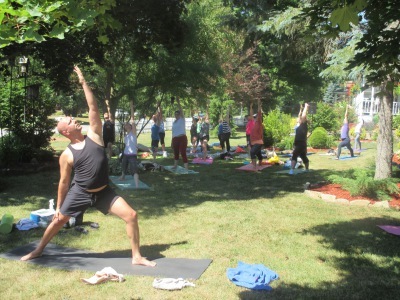 Twice yearly Cafe Troy offers a great Yoga Retreat. We are proud to offer this worthwhile event here at our facility. 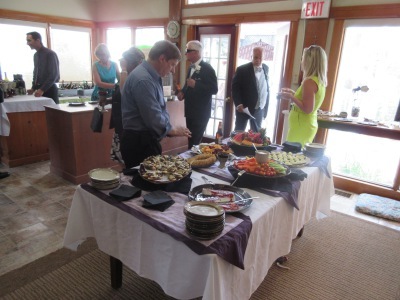 The retreat offers a gourmet Lunch as part of this event. 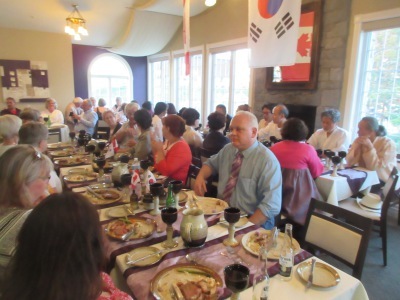 Our Restaurant seats 55 guest and is perfect of small cororate gathers and meetings. Some of the organizations that have used our facilties is the Liberal Party of Canada and the Brantford Toatmasters Organization. Please do not use this form to make a reservation, call our Cafe at 519-647-2117 line 2.